The Multi Utensil Holder Encourages independence. This is a comfortable and easily adjustable strap handle that provides a secure grip on any number of handle shapes and sizes, from cutlery to hair brushes. 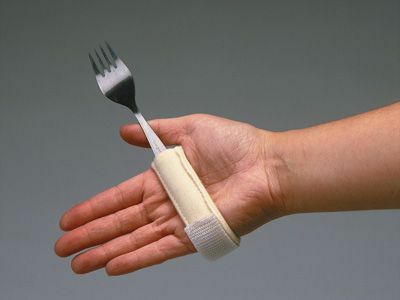 It's made from a soft stretchy fabric that allows people with limited hand function or a weak grip to safely hold utensils. Can be used by left or right handed users, and one size fits all - this utensil holder for the elderly and disabled will encourage independence and confidence. Bought this for my mum who has lost the use in the end of her fingers & strength following a stroke, so has a problem with gripping as she can\'t bend her fingers fully round. Great idea but she has found it difficult to use as quite difficult to guide it up to her mouth too. We did find that instead of securing around the hand, as demonstrated, it was easier to fold the strap to create a thick handle to wrap her hand around. Excellent strap, very comfortable to hold and use. Nice well made strap that I use for holding my pen. Delivered free and quickly. Would buy another if needed. I was pleased to find the Hand Strap it is comfortable to use but you must use the correct size cutlery if to big it breaks stitching. rapid delivery, i utillise these to help me type on the pc. rapid delivery, handy item, i convert to use as a typing aid.